Simon regularly makes presentations on investing. Click here for more information. Shocking but true: if all the money that’s ever been invested in hedge funds had been in treasury bills, the results would have been twice as good. Although hedge fund managers have earned some great fortunes, investors as a group have done quite poorly, particularly in recent years. Plagued by high fees, complex legal structures, poor disclosure, and return chasing, investors confront surprisingly meager results. Drawing on an insider’s view of industry growth during the 1990s, a time when hedge fund investors did well in part because there were relatively few of them, The Hedge Fund Mirage chronicles the early days of hedge fund investing before institutions got into the game and goes on to describe the seeding business, a specialized area in which investors provide venture capital-type funding to promising but undiscovered hedge funds. Today’s investors need to do better, and this book highlights the many subtle and not-so-subtle ways that the returns and risks are biased in favor of the hedge fund manager, and how investors and allocators can redress the imbalance. Year end recognition of my book came from the Wall Street Journal who included it on their Best Business Books of 2012 list as well as AllAboutAlpha.com which found it one of the five top stories of 2012. I continue to present at industry conferences on a fairly regular basis. In October I was at the Investment News Alternative Investments Conference in Chicago where I debated my book with Ed Butowsky, who runs a small fund of funds named Chapwood Capital. I’ll let the audience decide who won – at any rate, Ed has not asked for another shot at it. Earlier in November I was at the AR Symposium in New York where delegates and speakers alike made heroic efforts to attend following Hurricane Sandy’s huge disruption of the city’s transporation system. I sat on a panel with Greg Zuckerman from the Wall Street Journal and Jack Schwager who wrote Market Wizards. They’re both great writers and I was flattered to share the stage with them. We found much to agree on. Earlier this week AIMA made their second attempt at rebutting the conclusions in my book. I didn’t plan to respond because the mainstream financial press didn’t write about it – I presume many journalists concluded AIMA was a marketing organization for the hedge fund industry (which they are) and therefore did not deem their report newsworthy. But then Felix Salmon wrote a wonderful piece in which he demolished AIMA’s report far more eloquently than I ever could have. There’s a link to it on the right panel. It’s well worth reading. The Economist wrote a nice piece titled, “Masterclass” highlighting my book and another on hedge funds and our contrasting conclusions. The article concludes with, “Hedge-fund executives have already reacted angrily to ‘The Hedge Fund Mirage’” which is amusing because although most of the feedback I’ve received from the industry has been positive, even those who disagree with me (such as the London-based lobbying group AIMA) have struggled to produce a convincing rebuttal involving numbers. KPMG and AIMA issued a marketing report last week in support of hedge funds. It was a poorly argued case, based on the returns a hypothetical investor might have earmed from 1994 in an equally weighted portfolio of hedge funds and taking no account of the impact of size on returns. I went on Bloomberg TV to point out these weaknesses (see link on right) and wrote about it on my blog. Meanwhile, I continue to receive positive feedback from people in the industry, and will soon be embarking on a series of presentations to the Tiger 21 network. I continue to receive e-mails and calls from hedge fund managers and journalists with favorable feedback. I have also been invited to give the Keynote Address at the HedgeWorld 2012 Conference in Chicago in June. We are also seeing growing interest in our investment strategies, Alternatives to Alternatives, from investors embracing the message in my book. Last week’s presentation at the Factset Symposium went very well. The event was well organized and although unusually cool weather prevailed attendees seemed to feel it was worth the trip. A second Book Review in the FT (see link on right panel). There were also a couple of pieces on hedge funds in The Economist, one of which I noted in my blog. I continue to receive very complimentary feedback from readers which is always a great pleasure. The NYSSA presentation was very well received last week. Good turnout and many penetrating questions. Reviews continue to appear, virtually all positive. I have received invitations to present my ideas to two large institutional investors in hedge funds, so I’m very much looking forward to the next step in raising client awareness about the lopsided relationship they often have with the hedge fund industry. Today’s review by George Melloan in the Wall Street Journal has brought the ideas in my book to a wider audience. Judging from the response I am seeing, the message is resonating with an increasing number of institutional clients. 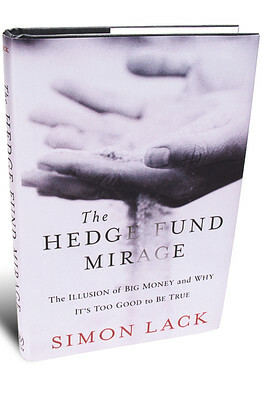 One CIO of a sizeable endowment noted that the book confirmed his long-held skepticism of hedge funds and he had distributed copies to several colleagues. We are beginning to stimulate a debate over terms. Sales continue to be strong and I am very happy with the overwhelmingly positive reaction from the mainstream financial media. I am receiving many requests for interviews from more specialized journals and I hope in some small way we are stimulating a needed debate about how hedge fund investors can achieve a much fairer split of the returns earned on their capital. Amazon rankings have been fascinating to watch. The book reached the top 0.1% of U.S. and UK sales, and was recently #35 on the U.S. Investment Books list, #3 on the UK equivalent. Media interest is growing with several articles written and TV and radio interviews being lined up. Feedback from readers is all positive, and nobody disputes the central point that investors have done poorly with hedge funds – in any event that is what the Math reveals. The book is finally out!! It is currently being shipped to bookstores around the world. Amazon sales have at times been in the top 0.5% of books, so with no easy reference points I’m happy with that. The publicity machine is picking up with TV and radio interviews as well as some upcoming reviews in print media. So far it is being well received and I very much hope it will help investors to be more discriminating in their future use of hedge funds. Tonight I fly to London for a few days. I have been invited on the Jeff Daniels Show on Sky on Wednesday, so I shall look forward to discussing some of the ideas in my book. We are also working on one or two other TV appearances. I chaired a panel at the AR Symposium. The title was, “What do investors want and how do they want it?” My panel of experts gamely responded to my mildly provocative questions, such as, “Since hedge fund investors in aggregate have lost money, what must they do differently in the future?” Happily I emerged from this meeting of the faithful unharmed. Copies of the review manuscript have been distributed to journalists who expressed interest to receive one. Meanwhile I am flattered to display the following endorsements, all from people whose opinion on such matters I respected greatly even before they were kind enough to write what you can read below. I gave a presentation to the CFA Society of Columbus, Ohio on Thursday, October 13. It was a pleasure speaking to such a financially literate crowd, and I thoroughly enjoyed the Q&A session that followed.